The past few years have brought an influx of new information into the field of male reproduction. Several laboratories have been able to apply the genomics approach to gene expression in the male, revealing previously unknown patterns of gene expression and gene products that were localized in male reproductive tract tissues and cells for the first time. These discoveries paved the way for the next wave, an opportunity to analyze male reproductive biology and the processes by which sperm are formed in the seminiferous tubule and androgen is synthesized in the interstitium of the testis. The different levels of organization in the testis, including the stages of spermatogenesis, enzymatic steps of steroidogenesis, and the intracellular signaling pathways of hormones, are now more amenable to study and selection of potential targets for drug development. This volume capitalizes on these developments with a collection of reports that is uniquely suited to stimulate research and development ideas. 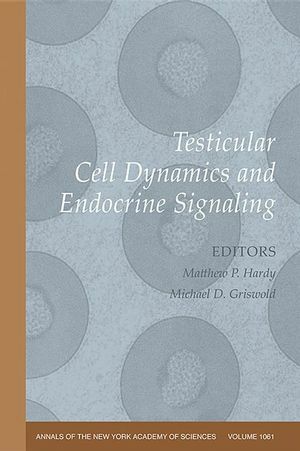 Matthew P. Hardy and Michael Griswold are the authors of Testicular Cell Dynamics and Endocrine Signaling, Volume 1061, published by Wiley. Preface: Matt Hardy and Mike Griswold. 1. Hormonal Regulation of Male Reproductive Tract Development. (Sunita Verma-Kurvari, Serge Nef, and Luis F. Parada). 2. Sox9 in Testis Determination. (Akio Kobayashi, Hao Chang, Marie-Christine Chaboissier, Andreas Schedl, and Richard R. Behringer). 3. Seminiferous Cord Formation and Germ-Cell Programming: Epigenetic Transgenerational Actions of Endocrine Disruptors. (Michael K. Skinner and Matthew D. Anway). 4. In Vitro Generation of Germ Cells: New Techniques to Solve Current Issues. (Joshua M. Baughman and Niels Geijsen). Part II: The Endocrine Axis. 5. Structure-Function Relationships of the Luteinizing Hormone Receptor. (David Puett, Yongsheng Li, Krassimira Angelova, Geneva Demars, Thomas P. Meehan, Francesca Fanelli, and Prema Narayan). 6. Transgenic Rescue of SF-1-Null Mice. (Tatiana Karpova, R. R. M. Maran, Jeremy Presley, Serge P. Scherrer, Lovella Tejada, and Leslie L. Heckert). 7. Estrogens in Testis Biology. (Jayne E. Sierens, Sharon F. Sneddon, Frances Collins, Michael R. Millar, and Philippa T. K. Saunders). 8. Foxa1 and Foxa2 Interact with the Androgen Receptor to Regulate Prostate and Epididymal Genes Differentially. (Xiuping Yu, Aparna Gupta, Yongqing Wang, Kichiya Suzuki, Janni Mirosevich, Marie-Claire Orgebin-Crist, and Robert J. Matusik). 9. Role of Glial Cell Line-Derived Neurotrophic Factor in Germ-Line Stem Cell Fate. (Laura Braydich-Stolle, Courtney Nolan, Martin Dym, and Marie-Claude Hofmann). 10. P450 Oxidoreductase Deficiency: A New Disorder of Steroidogenesis. (Walter L. Miller, Ningwu Huang, Amit V. Pandey, Christa E. Flück, and Vishal Agrawal). 11. Neuroendocrine Regulation of Leydig Cell Development. (P. J. O'shaughnessy, P. J. Baker, and H. Johnston). 12. Mitochondrial Function in Leydig Cell Steroidogenesis. (Dale B. Hales, John A. Allen, Tristan Shankara, Paul Janus, Steve Buck, Thorsten Diemer, and Karen Held Hales). 13. Determining Structure and Function of Steroid Dehydrogenase Enzymes by Sequence Analysis, Homology Modeling, and Rational Mutational Analysis. (William L. Duax, James Thomas, Vladimir Pletnev, Anthony Addlagatta, Robert Huether, Lukas Habegger, and Charles M. Weeks). 14. Postnatal and Pubertal Development of the Rhesus Monkey (Macaca mulatta) Testis. (Tony M. Plant, Suresh Ramaswamy, David Simorangkir, and Gary R. Marshall). 15. The mRNA Encoding CstF-64 Is Expressed Ubiquitously in Mouse Tissues. (Zane Huber, Roberto R. Monarez, Brinda Dass, and Clinton C. MacDonald). 16. Drivers of Germ Cell Maturation. (K. L. Loveland, C. Hogarth, S. Mendis, A. Efthymiadis, J. Ly, C. Itman, S. Meachem, C. W. Brown, and D. A. Jans). 17. Role of Nuclear Receptors in INSL3 Gene Transcription in Leydig Cells. (Jacques J. Tremblay and Nicholas M. Robert). 18. Analysis of the Human Sperm Proteome. (Daniel S. Johnston, Joe Wooters, Gregory S. Kopf, Yongchang Qiu, and Kenneth P. Roberts). 19. Male Gamete Contributions to the Embryo. (Ryuzo Yanagimachi). 20. The Androgen Microenvironment of the Human Testis and Hormonal Control of Spermatogenesis. (Jonathan P. Jarow and Barry R. Zirkin). 21. Sperm Chemotaxis: A Primer. (E. Hildebrand and U. B. Kaupp). 22. Epigenetic Regulation of Testis-Specific Gene Expression. (John R. McCarrey, Christopher B. Geyer, and Hirotaka Yoshioka).